According to Cisco, the number of devices connected to the Internet of Things (IoT) today is 15 billion, and this number is set to rise to 50 billion devices by 2020. Undoubtedly, IoT is defining and reshaping markets to the extent that its growth has been termed as ‘the next Industrial Revolution.’ Essentially, IoT has influence over the way people work, entertain, travel, communicate and live. For business, fast adopters are likely to reap the most advantage due to the compelling competitive advantage that is to be gained. In fact, according to a March 2014 Gartner report, IoT products and services will generate incremental revenue exceeding $300 billion. IDC further complements statistics by predicting that IoT solutions will reach a market value of $7.1 trillion by 2020. With these numbers in mind, marketers need to target the IoT industry and find solutions to the challenges that businesses face. B2B Lead generation is about attracting and converting potential clients to be interested in what’s on offer. Internet of Things Lead Generation is, therefore, about identifying consumers that are interested in buying IoT solutions and getting them into the B2B buying process. There are several ways that this can be achieved including through content marketing (e.g., Whitepaper syndication), word-of-mouth referrals, public relations, seminars, webinars, referrals, social media marketing, and so on. There are several challenges that businesses adopting (or that wish to adopt) IoT face. In fact, according to the World Economic Forum, 88% of business leaders are overwhelmed by the impact of IoT on their business models and the resulting long-term implications. Such challenges can definitely be opportunities for those that seek to understand the underlying issues and that go a step further to find ways to address the problems squarely. Defining a value proposition. Sometimes the B2B buyer may not understand the unique value proposition that an IoT product or service may have for their business. Marketers must make the buyer understand how the IoT solution will bring real value to the company in question. Lack of adequate stakeholder knowledge: Stakeholders often have varying familiarity with IoT systems including their impacts and risks. For example, technical buyers may understand IoT but may lack decision-making powers. On the other hand, decision-makers may lack technical IoT knowledge. As such, marketers must find ways to speak to different stakeholders in a meaningful way and prepare each of the collaborating stakeholders for a sale. Security concerns: Security is a massive concern for IoT consumers. The buyer must trust that the IoT solution will not compromise their business in any way. Marketers must, therefore, establish trust for their IoT solutions by assuring B2B buyers and educating them about security protocols used and risks involved. Insufficient touchpoints to understand IoT: B2B buyers generally expect more information and a longer sales cycle before they can make a decision. IoT marketers should expect an even longer buying process due to a longer learning curve in IoT. As such, marketers should provide buyers with more touchpoints as is expected. Lack of relevant, meaningful and reliable data: B2B buyers rely on data to make impactful decisions. As such, they expect that data will not only be relevant and meaningful for their specific needs but also reliable. Additionally, B2B buyers expect that essential data from IoT systems can be visualized and gamified to better understand outcomes/benefits. IoT B2B marketers must, therefore, understand the value of data for the business in addition to being adept at big data solutions. Given the challenges mentioned above, one of the best marketing methods for solving these IoT marketing-related challenges is by using inbound marketing. 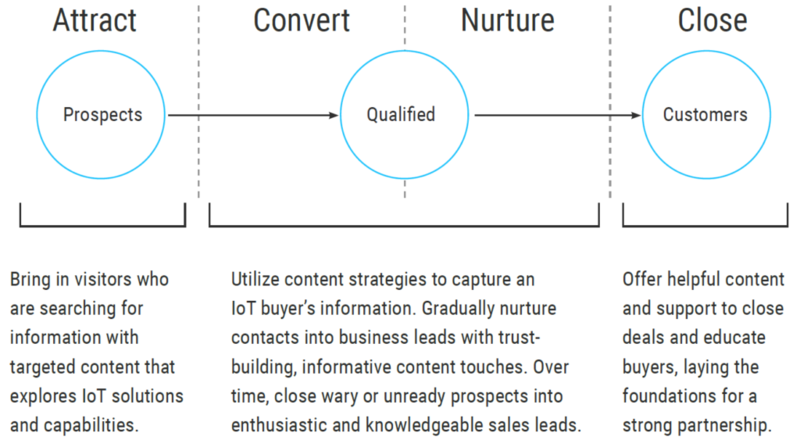 More specifically, content-driven inbound marketing strategies can be used to attract, convert, nurture, and close IoT leads into customers. The emphasis of this blog post will be on inbound strategies for attracting and converting leads for IoT solutions. Below are some of the strategies that can be used. According to FC Business Intelligence, the top challenge for adopting IoT solutions is understanding the technology followed by legacy systems and then security. (55% understanding the technology, 39% legacy systems, 33% security). Additionally, technical and non-technical stakeholders have varying familiarity with IoT. As such, marketers need to overcome this education curve by providing the right educational material to the right person at the right time. Content marketing can answer IoT stakeholder hesitations through providing quality content in various ways including through SEO blogs, guides, whitepaper syndication, information graphics, webinars, data visuals, and videos. Since B2B buyers will generally trust the provider that educates them first, early-stage content will benefit IoT B2B buyers by providing them with information that will help them understand the value and benefits of IoT. The content must provide information about the reasons for investing in IoT. As the lead moves through the B2B buying process, content will also be useful for providing additional information including interoperability between machines and devices using different protocols or that have different architectures. It’s important to note that according to Stratabeat, 80% of business decision-makers prefer to read a series of articles as opposed to viewing an ad when it comes to acquiring company information. 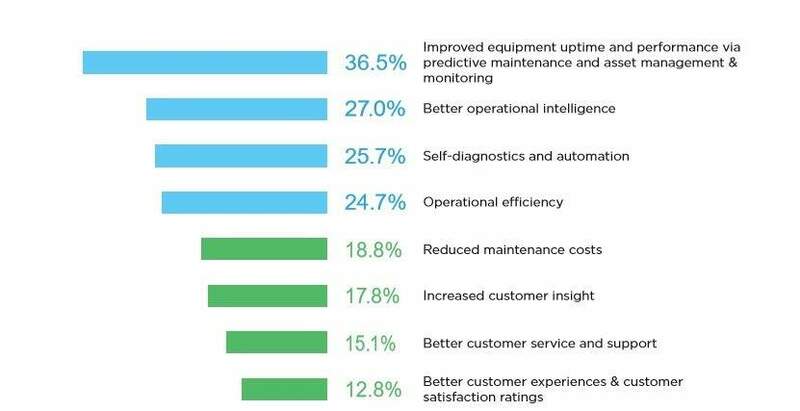 In research conducted by The Innovation Group, 55% of respondents expect that an IoT solution will improve their efficiency with operations management. So, the question is, how does a marketer convince and inspire a buyer that their solution is feasible and valuable in achieving operational efficiency, optimization of asset utilization, reduction in downtime, improved productivity, the creation of new business opportunities, etc.? The answer is to focus on the buyer’s core pain point and less on product features. An excellent way to demonstrate this is by providing case studies of an exemplary use of your IoT solution or product. Build and reinforce relationships with key B2B IoT influencers in editorials, trade publications, associations, and content networks. The idea is to simplify complex ideas that will have a clear advantage in educating and attracting all the stakeholders involved in the IoT buying process. According to 2018 Forrester Research, 77% of B2B firms stated that increasing their use of analytics and data as being a critical priority over the next year. IoT marketers have an even stronger compelling reason to use analytics tools to track metrics that have a bearing on the product and on business growth. One reason for this is that B2B IoT buyers usually go through a longer buying process. As for data-driven insights about IoT leads, these should definitely be used to guide segmentation. Segmenting campaigns first requires the marketer to segment leads, and this is only possible through gathering data and analysis which is made a lot easier with marketing automation software. Which leads are the decision-makers? Which leads are technologists and who are the non-technical/business buyers? What pain points, hesitations, and questions do specific buyer segments have? 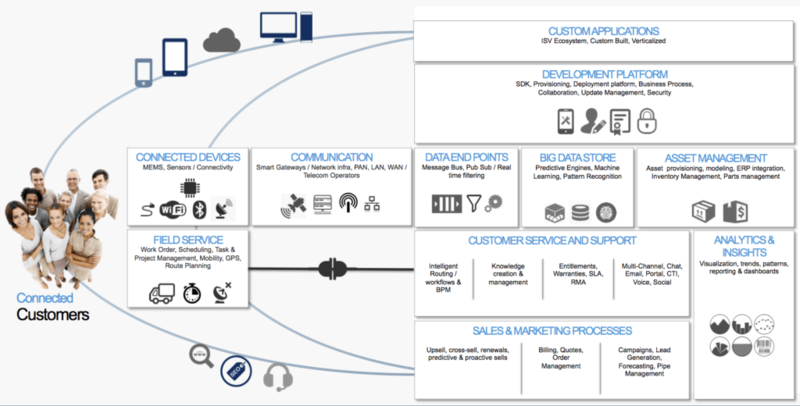 What level of IoT complexity is appropriate for each segment and what education do they need? Another way to segment your IoT leads is by industry. Some of the sectors that are in constant need of IoT solutions include the following: transportation, urban planning, manufacturing, healthcare, and medical, banking and finance. Once you understand different segments better, send targeted campaigns to educate and build trust. Progressively, marketers are turning to technical B2B marketing approaches due to the ever-increasing complexity in B2B marketing. Some of the popular technical B2B marketing approaches used include multi-channel touch points, advocacy programs, intent marketing, and account-based marketing. Having in-house experts to manage these technical approaches let alone all the necessary resources and tools can overburden a business and specifically the marketing team. This is why outsourcing MarTech has become very popular today. IoT solutions providers can outsource to lead generation agencies that specialize in different areas of expertise including IoT, SaaS, high tech, and marketing automation. These agencies generally have teams of writers, designers, developers, UX experts, analysts and project managers that can proficiently implement brand building and lead generation campaigns. 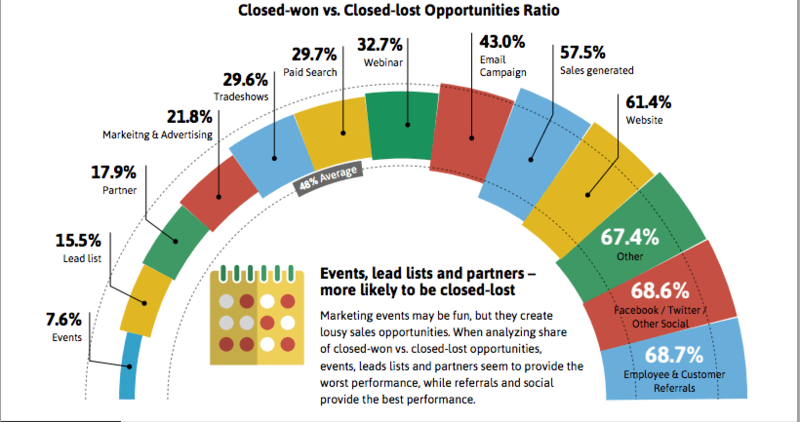 B2B buyers highly rely on referrals as the source of leads for their organization. In fact, according to Hubspot State of Inbound 2018 Global Results, referrals are rated as the highest quality leads. Target prospects and leads are more likely to listen to close acquaintances and friends that have benefited from IoT solutions. Additionally, building trust with prospects that have been referred to you is a lot easier because they have already open to the fact that you are worth a shot. All you have to do is to prove to them that you are the right choice for them. Lead generation targeting IoT has its particular set of challenges that marketers need to address. If these challenges are addressed, by focusing on the different stakeholder-buyer pain points, then a whole world of opportunity opens up for doing business.